I am not into superstitions. I don’t read my horoscope. I don’t throw salt over my shoulder. After 4 months of trying to sell the Casa de dos Quesos, I broke down and buried St Joseph in the yard, because, technically, that’s Catholicism. And if St Joe comes though, as people promise me he will, then it is not superstition but a miracle. BTW, if anyone wants to buy a six bedroom farmhouse in Wisconsin that is great for writing in, message me! I am mot superstitious. But I am totally on with fortune cookies. The day of my first book release, I went out for Chinese and got a fortune (which I lost and cannot quote exactly) that said something about my creativity making many people happy. Which I did, not that it netted me anything. And that was at the late great and thoroughly lamented Lucy’s South American/Chinese Restaurant. 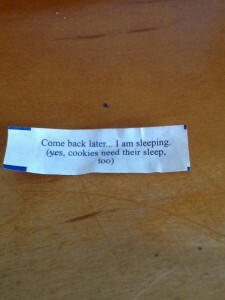 It was a weird fortune. Maybe fortune cookie are different on the other side of the Equator. But the empanadas were good, so what did it matter? And there was that fortune I got at #1 Son’s house that was written in Spanish. But he was living with a Peruvian Jew at the time. Hands across the water. Do not argue with the cookie. 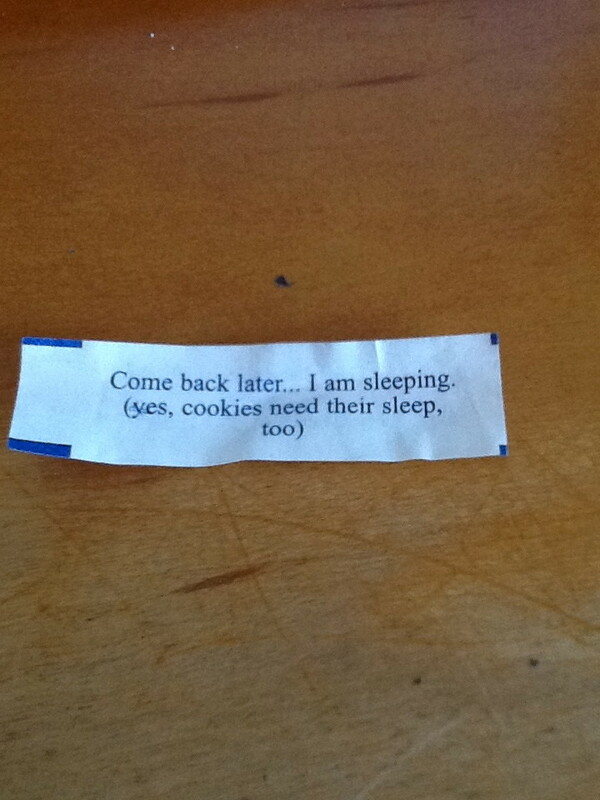 I am used to getting weird fortunes. But I was not prepared to get this. And how much later was I supposed to come back? Was I supposed to take another trip to the buffet, or should I go back tomorrow? Anyone else get weird cookies? If there are, they will be my kind of ghosts. I wanted a house with fewer stairs and a place to display a dragon skull and some swords. Where else was I going to move? We are selling the house. And St Joseph is in the ground, feet towards heaven, under a pine tree. I am almost afraid to talk about the new place, since I have wanted it from the first moment I found it. But if all goes well, we will be moving to a renovated Catholic church. Obviously ,I do not eat at the right Chinese restaurants. I just get boring stuff and lotto numbers. St Joseph works–you just cannot be picky about the buyer. You are selling the house ?